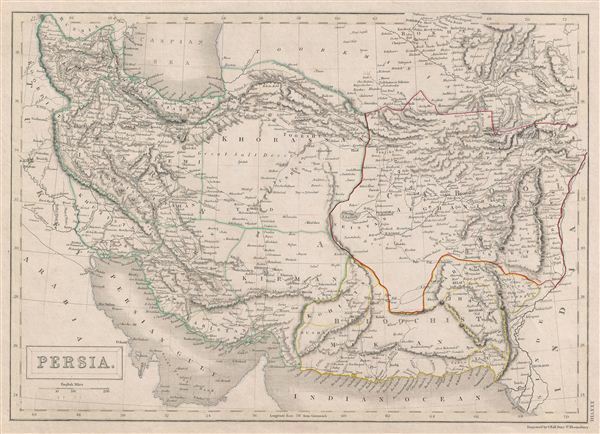 A fine example of Adam and Charles Black's 1840 map of Persia. Set between the Caspian Sea and the Persian Gulf, this map covers all of modern day Iran and Afghanistan as well as parts of adjacent Pakistan, and Iraq. Persia at this time was controlled by the powerful Qajar Dynasty of Shahs. This map was engraved by S. Hall for issue in the 1840 edition of Black's General Atlas. Good condition. Even overall toning. Blank on verso. Philips (atlases) 4334. Alai, C., General Maps of Perisa 1477-1925, E278.